Change of address? Need information Questions regarding dues? Did you retired in 1992 or before? Are you 80 years old? Could you be eiligible for Emeritus Membership? (ORTA). The Ohio Retired Teachers Association is the State-wide voice of Ohio's retired public educators. ORTA advocates and promotes the improvement of pensions, benefits, and services available to Ohio's active and retired public educators. The Association represents and takes action on behalf of our constituents to STRS OHIO, the Ohio Legislature and other agencies dealing with retirement issues. Ann Hanning, ORTA's Executive Director, states: "It is most important that we continue to work toward securing the STRS defined benefit pension plan, the fiduciary role of the pension boards and access to affordable retiree health care." -ORTA promotes quality healthcare coverage through a leadership role in healthcare coverage and pension advocate. 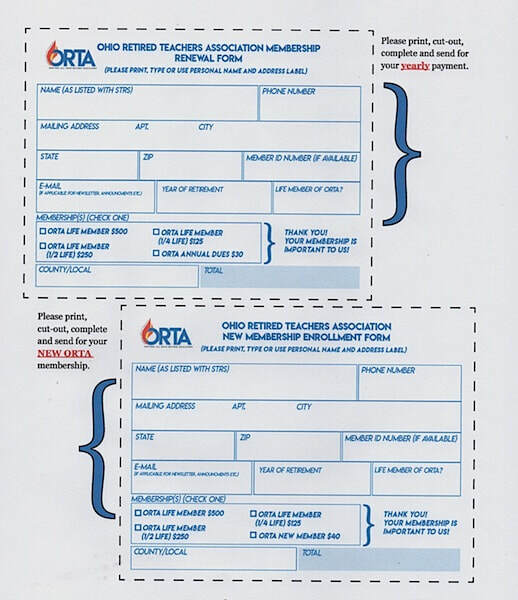 -ORTA represents Ohio's retired teachers at STRS meetings and Board Meetings. -ORTA represents Ohio's retired teachers in Washington,D.C. -ORTA opposes mandatory Social Security for Ohio's Teachers. -ORTA participates in the National Retired Teachers Association. -ORTA represents retired teachers in the Ohio's General Assembly. -ORTA testifies at State Legislative Hearing Committees. -ORTA monitors and tracks all legislation affecting retired teachers. -ORTA maintains a staffed state office to coordinate statewide activites and support local chapters, like HCRTA. -ORTA has 65 years of experience in serving Ohio's retired educators since 1947. -ORTA provides access to a Membership Benefits Association that provides such services as insurance, travel packages,and discounts. 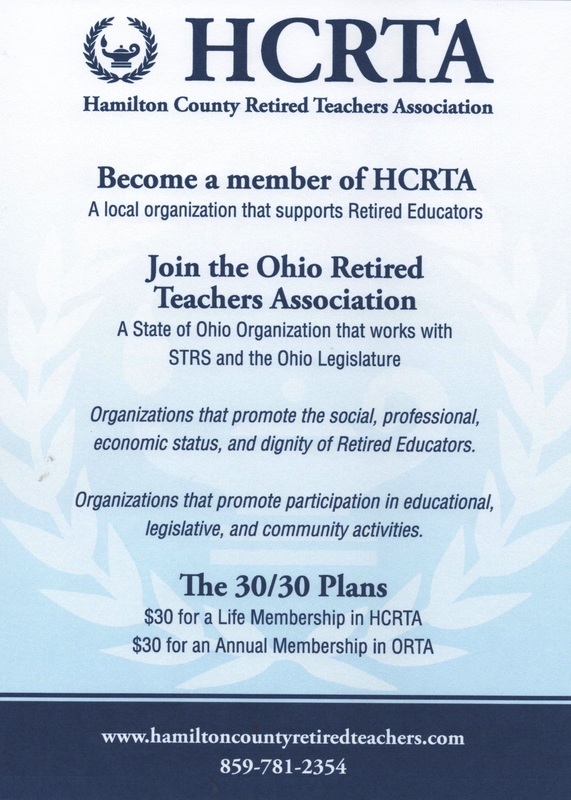 -ORTA works exclusively for Ohio's retired teachers. -And ORTA has a great website at www.orta.org check it out. to HCRTA and we will send it to ORTA. Do you know of any teachers or administrators retiring at the end of the year? Or do you know any retired educators that are not members of HCRTA? Then how about helping them become members! Invite them to join. Give them a blank membership and register them to come with you toa luncheon. Tell them what we do, and encourage them to join and become active members. 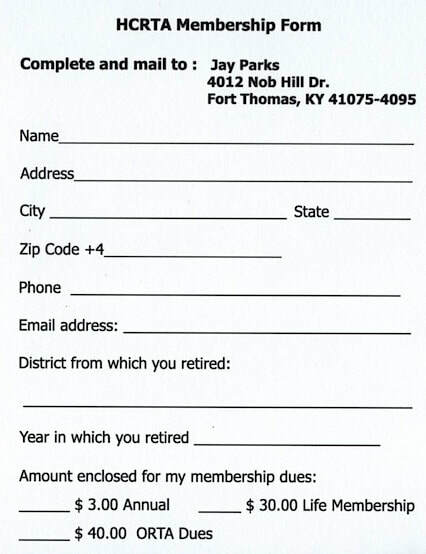 If you have a friend or colleague retiring, a gift of a $30.00 Life Membership in HCRTA makes a great retirement gift! And if you know of anyone retiring at the end of this school year, please send us their name and address. We will send them a special packet of information and a special invitation to our September meeting, including a free lunch! We need your help: If you move or change address, don't wait for your Newsletter to be forwarded. Call Kent Rawlings with your new address so that we are able to send your Newsletter to you in a timely manner. Please notify us before you move.